EdX offers full support for this problem type. The multiple choice problem type is a core problem type that can be added to any course. At a minimum, multiple choice problems include a question or prompt and several answer options. By adding hints, feedback, or both, you can give learners guidance and help when they work on a problem. For more information about the core problem types, see Working with Problem Components. In multiple choice problems, learners select one option from a list of answer options. Unlike dropdown problems, where the answer choices do not appear until the learner selects the dropdown arrow, answer choices for multiple choice problems are immediately visible directly below the question. Multiple choice problems can also have several advanced options, such as reordering, or shuffling, the set of answer choices for each learner. For more information about these options, see Advanced Options for Multiple Choice Problems. In the LMS, learners select a single answer option to complete a multiple choice problem. An example of a completed multiple choice problem follows. To add the example problem illustrated above, you enter the following text and Markdown formatting in the simple editor in Studio. it to balance in turbulent water. lateral inhibition using horseshoe crabs. The open learning XML (OLX) markup for this example problem follows. 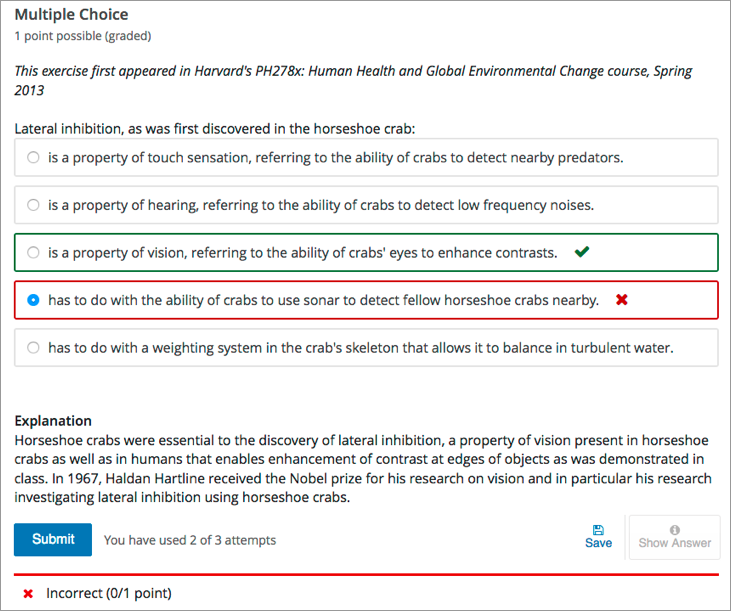 For the multiple choice problems in your course, you can use edX Insights to review aggregated learner performance data and examine the submitted answers. For more information, see Using edX Insights. EdX recommends the use, whenever possible, of authentic assessment rather than multiple choice questions for graded problems. The use of authentic assessment in online courses tends to lead to better learning outcomes. In addition, authentic assessment allows for infinite attempts, mastery learning, and more intellectual risk taking, which lead to substantially better learning outcomes. Multiple choice questions do have these uses. Ungraded multiple choice questions can help students think about a concept in the context of knowledge transfer. For many subject areas, authentic assessments are either unavailable or prohibitively complex to use. In such courses, multiple choice questions can act as the only available fall back. Fortunately, multiple choice questions are among the best studied in assessment literature. A few guidelines for the creation of such questions follow. Organize the set of answers logically. Use consistent phrasing for the answers, and when possible, parallel structure. Place as many of the words in the stem as possible, and keep the answers as concise as possible. The distractors should not be substantially shorter, longer, or use different structure than the correct answer. The answer options should be as consistent in structure, length, and phrasing as possible. Avoid using negatives (and especially double negatives) in the question and the answers. Test higher order thinking (comprehension and critical thinking). Avoid simple recall. If you specify a finite number of attempts, avoid trick questions and try to keep wording clear and unambiguous. Use “All of the above” and “None of the above” answer options with caution. If a learner can identify at least two correct answers, it can give away the answer with only partial comprehension. You add multiple choice problems in Studio by selecting the Problem component type and then using either the simple editor or the advanced editor to specify the prompt and the answer options. You can begin work on the problem in the simple editor, and then switch to the advanced editor. However, after you save any changes you make in the advanced editor, you cannot switch back to the simple editor. When you add a multiple choice problem, you can choose one of these templates. These templates include the Markdown formatting that you use in the simple editor to add a problem without, or with, hints and feedback. To use the simple editor to add a problem, follow these steps. In the unit where you want to create the problem, under Add New Component select Problem. From the list of Common Problem Types, select the type of problem you want to add. Studio adds a template for the problem to the unit. Select Edit. The simple editor opens to a template that shows the Markdown formatting that you use for this problem type. Replace the guidance provided by the template to add your own text for the question or prompt, answer options, explanation, and so on. To format equations, you can use MathJax. For more information, see Using MathJax for Mathematics. Select Settings to provide an identifying Display Name and define settings for the problem. For more information, see Defining Settings for Problem Components. You can use the advanced editor to identify the elements of a multiple choice problem with OLX. For more information, see Multiple Choice Problem OLX Reference. To use the advanced editor to add a problem, follow these steps. Follow steps 1-3 for creating the problem in the simple editor. Select Advanced Editor. The advanced editor opens the template and shows the OLX markup that you can use for this problem type. Replace the guidance provided by the template to add your own text. For example, replace the question or prompt, answer options, and explanation. Update the OLX to add optional elements and attributes required for your problem. For an overview of feedback in problems, see Adding Feedback and Hints to a Problem. You can add feedback for each of the answer options you provide in the problem. Use the following guidelines when providing feedback. Add feedback to incorrect answers to target common misconceptions and mistakes. Ensure feedback provides some guidance to the learner about how to arrive at the correct answer. Add feedback for the correct answer to reinforce why the answer is correct. Because learners are able to guess, ensure that feedback provides a reason why the answer is correct for learners who might have selected that answer by chance. You can add feedback in a multiple choice problem using the simple editor or the advanced editor. You can configure feedback in the simple editor. When you add a multiple choice problem, select the template Multiple Choice with Hints and Feedback. This template has example feedback syntax that you can replace. For example, the following problem has feedback for every answer option. In the advanced editor, you configure feedback with the following syntax. For example, the following problem has feedback for each answer. <choicehint>Many people mistakenly think a tomato is a vegetable. By default, the feedback labels shown to learners are Correct and Incorrect. If you do not define feedback labels, learners see these terms when they submit an answer, as in the following example. seeds classifying it as a fruit. You can configure the problem to override the default labels. For example, you can configure a custom label for a specific wrong answer. it is classified as a fruit. The default labels Correct and Incorrect display in the learner’s requested language. If you provide custom labels, they display as you define them to all learners. They are not translated into different languages. In the simple editor, you configure custom feedback labels with the following syntax. That is, you provide the label text, followed by two colon (:) characters, before the feedback text. For example, the following feedback is configured to use a custom label. In the advanced editor, you configure custom feedback labels with the following syntax. For example, the feedback for the following answer option is configured to use a custom label. You can add hints to a multiple choice problem using the simple editor or the advanced editor. For an overview of hints in problems, see Adding Feedback and Hints to a Problem. In the simple editor, you configure hints with the following syntax. You can configure any number of hints. The learner views one hint at a time and views the next one by selecting Hint again. For example, the following problem has two hints. In the advanced editor, you add the <demandhint> element immediately before the closing </problem> tag, and then configure each hint using the <hint> element. For example, the following OLX for a multiple choice problem shows two hints. You can configure a multiple choice problem so that specific incorrect answers award learners partial credit for the problem. You must use the advanced editor to configure partial credit. Support for partial credit problems in courses on edx.org and edX Edge is provisional. Ensure that you test such problems thoroughly before releasing them to learners. For more information, contact your edX partner manager. In the following example, the learner selected a wrong answer and received partial credit. You can specify what percentage of the points for the problem a learner receives for an incorrect answer. If you do not specify the percentage, the system uses the default of 50%. For an overview of partial credit in problems, see Awarding Partial Credit for a Problem. To configure a multiple choice problem to award partial credit for a specific answer, you add the following attributes to the problem OLX. Add the partial_credit="points" attribute to the <multiplechoiceresponse> element. For each answer that you intend to award partial credit, in the <choice> element set the value of the correct attribute to "partial". Optionally, define the percentage of the problem score to award for each answer. Add the point_value attribute to the <choice> element, and enter its value as a decimal. For example, add point_value="0.25" to award 25% of the points to learners who select that answer. The percentage awarded should reflect how close the learner has gotten to a full understanding of the concept. If you do not add the point_value attribute, the system uses the default of 50%. For example, the following OLX shows a multiple choice problem that provides partial credit of 25% for an answer option. You can also set attributes and options by adding a <script> element. For more information, see Using the Script Element. For multiple choice problems, the <problem> element can include this hierarchy of child elements. In addition, standard HTML tags can be used to format text. Required. Indicates that the problem is a multiple choice problem. partial_credit Optional. Specifies that the problem can award partial credit. If used, must be set to "points". Required. Identifies the question or prompt. You can include HTML tags within this element. Optional. Provides clarifying information about how to answer the question. You can include HTML tags within this element. Required. Indicates the beginning of the list of answer options. type Required. Must be set to "MultipleChoice". Additional attributes are available to support advanced options. Required. Lists an answer option. Indicates a correct, incorrect, or partially correct answer. When set to "true", the choice is a correct answer. At least one required. When set to "false", the choice is an incorrect answer. When set to "partial", the learner receives partial credit for selecting the answer. You can specify more than one correct or partially correct answer, but learners can select only one choice to submit as their answer. point_value When correct="partial", indicates the percentage, as a decimal, of the points the learner receives for selecting this option. If point_value is not specified for a partial credit answer, 50% is used by default. name A unique name that is used internally to refer to the choice. Optional. Specifies feedback for the answer. Optional. Identifies the explanation or solution for the problem, or for one of the questions in a problem that includes multiple questions. This element contains an HTML division <div>. The division contains one or more paragraphs <p> of explanatory text. Optional. Specifies hints for the learner. For problems that include multiple questions, the hints apply to the entire problem. Required. Specifies additional information that learners can access if needed. Multiple choice problems have several advanced options. You can change the order of answers in the problem, include explanations that appear when a learner selects a specific incorrect answer, or present a random set of choices to each learner. For more information, see the following sections. Optionally, you can configure a multiple choice problem so that it shuffles the order of possible answers. For example, one view of a problem could be as follows. What Apple device competed with the portable CD player? Another view of the same problem, for a different learner or for the same learner on a subsequent view of the unit, could be as follows. You can also shuffle some answers, but not others. For example, you might want to include the answer “All of the above” and have it always appear at the end of the list, but shuffle the other answers. You can configure the problem to shuffle answers using the simple editor or advanced editor. To shuffle the answers, you also edit the problem to set Randomization to a value other than Never. For more information, see Randomization. You can configure the problem to shuffle answers in the simple editor. To add shuffling to this problem, you add an exclamation point character ! between the parentheses formatting for the first answer option. To make the location of an answer fixed in a shuffled list, add @ between the parentheses formatting for that answer. You can combine symbols within the parentheses as necessary. For example, to show the correct answer in a fixed location, you can use both x and @. After you complete problem setup in the simple editor, select Edit and then Settings to specify an option other than Never for the Randomization setting. You can configure the problem to shuffle answers by editing the OLX in the advanced editor. To add shuffling to a problem, you add shuffle="true" to the <choicegroup> element. To make the location of an answer fixed in a shuffled list, add fixed="true" to the choice element for the answer. Then, you select Settings to specify an option other than Never for the Randomization setting. You can configure a multiple choice problem so that explanations for specific answers are automatically shown to learners. You can use these explanations to guide learners towards the right answer. Therefore, targeted feedback is most useful for multiple choice problems for which learners are allowed multiple attempts. You configure the problem to provide targeted feedback by editing the OLX in the advanced editor. Add a targeted-feedback attribute to the <multiplechoiceresponse> element, with no value: <multiplechoiceresponse targeted-feedback="">. Add an explanation-id attribute with a unique value to each of the <choice> elements: <choice correct="false" explanation-id="feedback1">. You can use the <solution> element for the correct answer. Add a <targetedfeedbackset> element after the <multiplechoiceresponse> element. Within <targetedfeedbackset>, add one or more <targetedfeedback> elements. Within each <targetedfeedback> element, add one of the unique identifying explanation-id attributes to map that feedback to a specific answer choice. Within each <targetedfeedback> element use HTML formatting, such as <p></p> tags, to enter your explanation for the specified answer option. For example, the OLX for a multiple choice problem follows, showing a unique ID for each answer choice. This is immediately followed by OLX that defines the targeted feedback. You can configure a multiple choice problem so that a random subset of choices are shown to each learner. For example, you can add 10 possible choices to the problem, and each learner views a set of five choices. The answer pool must have at least one correct answer. It can have more than one correct answer. In each set of choices shown to a learner, one correct answer is included. For example, you can configure two correct answers in the set of choices. One of the two correct answers is included in each set that a learner views. You configure the problem to provide answer pools by editing the OLX for the problem in the advanced editor. In the <choicegroup> element, add the answer-pool attribute, with the numerical value indicating the number of answer options to show to learners. For example, <choicegroup answer-pool="4">. If you include more than one correct answer among the options, for each correct answer add an explanation-id attribute with a unique value to the <choice> element: <choice correct="false" explanation-id="correct1">. If you include more than one correct answer among the options, for each <solution> element, add an explanation-id attribute and a value that maps back to a specific correct answer. For example, <solution explanation-id="correct1">. Place the <solution> elements within a <solutionset> element. If the choices include only one correct answer, you do not have to use the explanation-id in either the <choice> or <solution> element. You do still use the <solutionset> element to wrap the <solution> element. For example, for the following multiple choice problem, a learner will see four choices. In each set, one of the choices will be one of the two correct choices. The explanation shown for the correct answer is the one with the same explanation ID. You can use the <script> element to programmatically set attributes and options for your multiple choice problems. You could use this feature to display different questions/answers depending on variable factors, like time of day, or randomly generated numbers. You must use the advanced editor to configure a <script> element. The contents of the <script> element must be enclosed in <! [CDATA[ … ]]> markers, to indicate that the enclosed code should not be interpreted as XML. The code in the <script> element is run on the server before the problem is shown to learners. Note that only Python script types are supported. The following OLX example uses random numbers to generate different answer choices for each learner, and mathematical operators to determine each choice’s correctness. random.seed(anonymous_student_id)  # Use different random numbers for each student. text0 = "$a + $b is even"
text1 = "$a + $b is odd"